Hello relaxation! Colin catches a few off the dock while Milli the lodge dog hangs out. What can we expect from a trip to your lodge? That’s the question we get from almost everyone considering a trip to Lloyd Lake. Well, we just had an incredible weekend with 12 guests. Late Thursday afternoon, we hear the buzz of 2 Cessna Grand Caravans. The first plane is on floats. 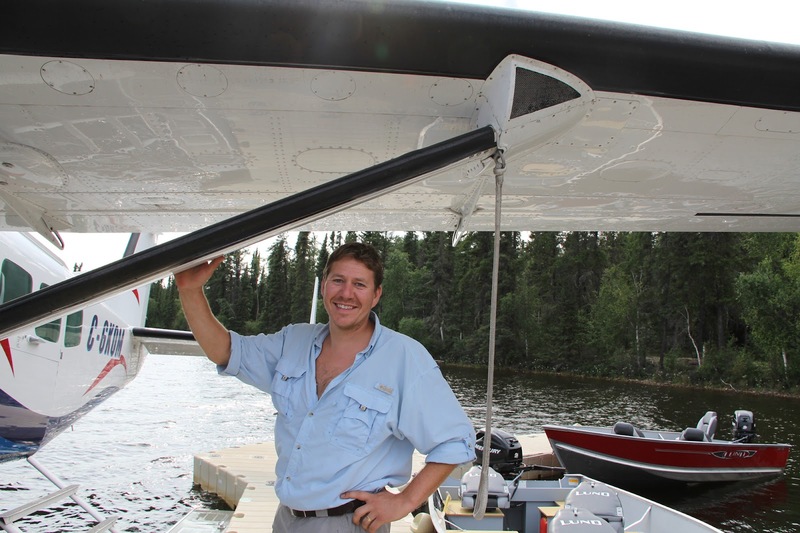 As it pulls up to the dock, Derrick greets everyone and shows each group to their cabin. Desi flies in on the second plane. He’s just finished honeymooning in Hawaii. Their dad, Don, who’s been working with them on the lodge the whole time, meets them at the airstrip. Our guests don’t know it yet, but they’ve just stepped into paradise for 3 days. That’s what lovely couple John and Sheryl from Fort MacMurray tells us on Sunday. 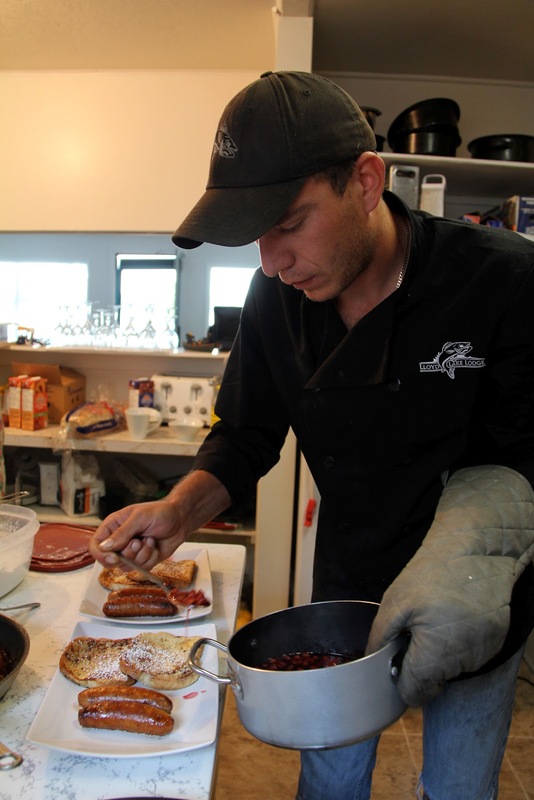 Once everyone gets settled in their cabin, Desi hooks them up with Saskatchewan fishing licenses and any tackle and bait they require from Tight Lines Tackle (Lloyd Lake’s new tackle and snack shop). Some guests wander down to the dock and check out the conference cabin. 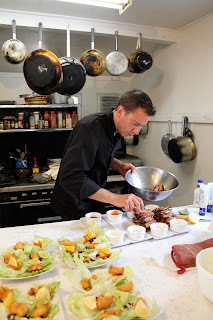 Derrick’s in the kitchen getting the first of 3 fabulous dinners ready to go. Derrick dishes out seconds of the cabbage soup while plating the smoked lake trout salad. Thursday night’s food is ridiculously delicious: homemade potato chips, smoked lake trout salad, cabbage soup, roasted chicken, and coconut chocolate cream cheese cups. While the food is tasty, all 12 guests are anxious to get on the water. By 7:30, everyone’s in their boat, ready to get a first taste of fishing at the lodge. Smiling faces come back around sunset. No big ones, but enough action to take the edge off. Our guests sit back on their private decks with a drink or 2, taking in the scenery and feeling the beginnings of the relaxation they came for soaking into their bones. Sheryl and John come in after some good fishing. Friday morning starts with breakfast at 7. 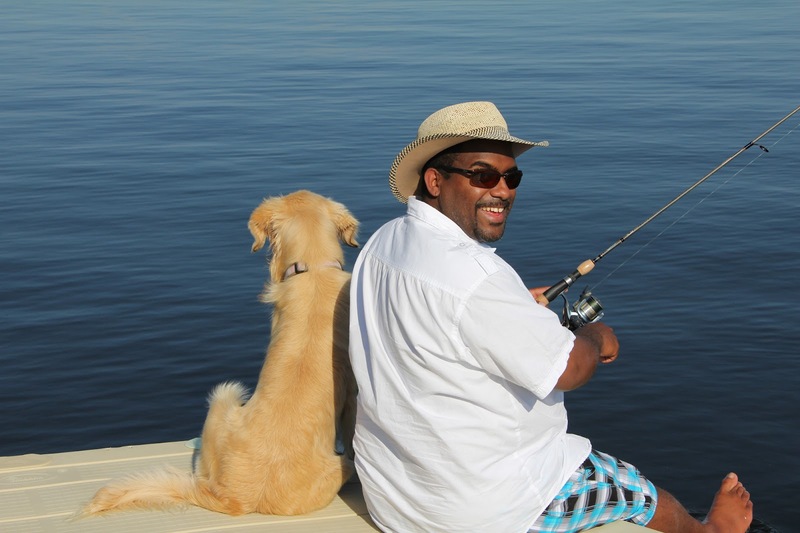 With bellies full of bacon and eggs, everyone heads out for their first full day of fishing. All the guests fish Lloyd Lake today, and 6 boats loaded with tackle, shore lunch boxes, pro guides and anticipation-filled guests depart shortly after 8. Watching boats full of our guests leave the dock is one of the best feelings in the whole world. Quiet descends on the camp, and we usually sit on the dock for a half hour taking a breath, catching up to make sure all our guests are happy, and appreciating the satisfaction each of us feels to be a part of creating this awesome experience for our clients. Happy guests are our ultimate reward, so we work damn hard to meet everyone’s expectations. The golden rule here? If there’s anything we can do to make your trip better, all you have to do is ask. We’ll go the extra mile every time, just to see the smile on your face. That probably sounds like marketing speak you’ve heard before, but check out our guest comments. Those say a lot, and we’re proud of them. While we’re taking a breather on shore, our guests get to their first spots for the day. Usually the first priority of the morning is catching shore lunch. 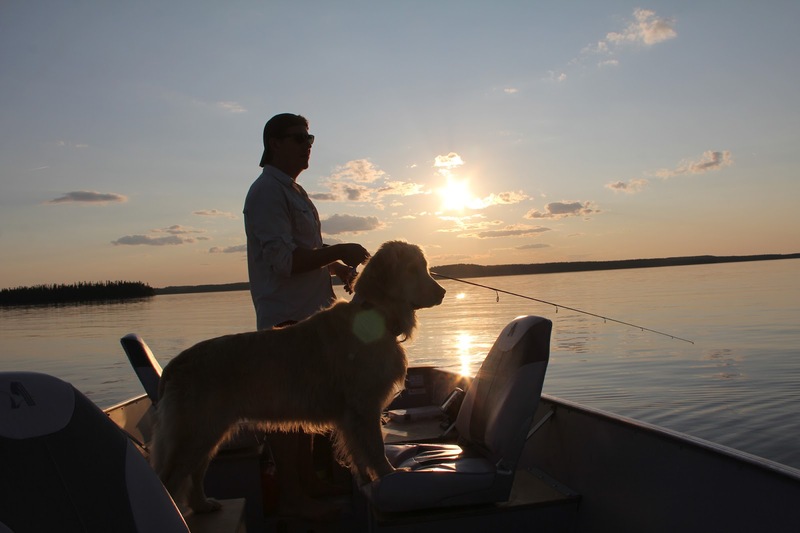 On Lloyd Lake that means either catching walleye or northern pike. Friday’s fishing is definitely decent, and no one eats beans and potatoes at lunch. It’s a hot day, so after shore lunch some guests try out our pretty sand beaches. Believe it or not, we have beautiful beaches here. At some of them the water is shallow for a while. When the weather has been consistently hot for a few weeks the way it usually is in July and August, the water there is lukewarm. 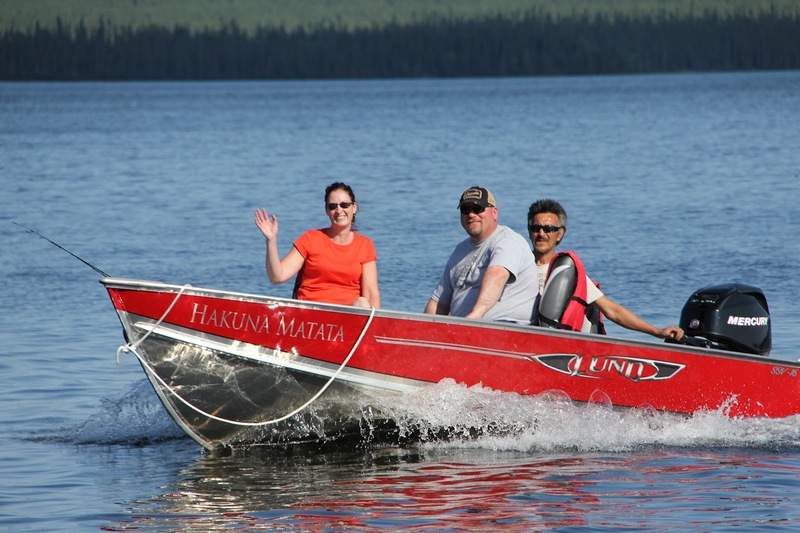 Makes it easy to get wet, but also has some guests asking their guide to drive the boat to the middle of the lake so they can take a dip in some colder water to really cool off! 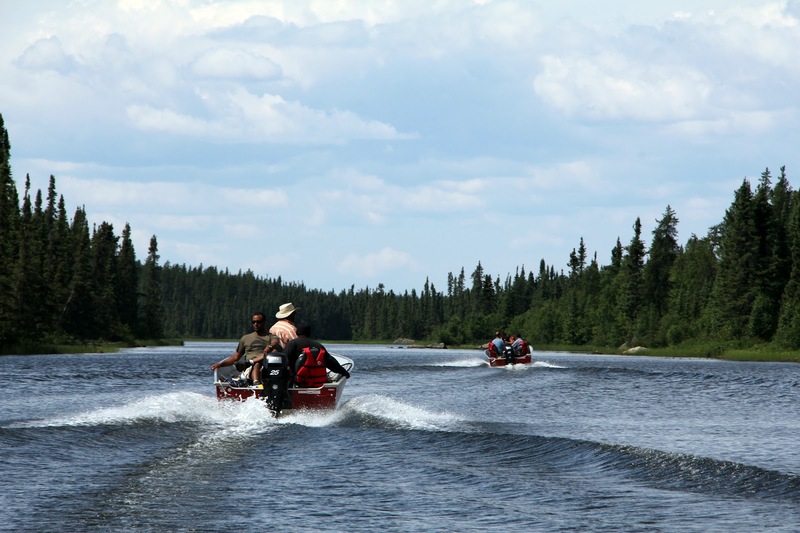 Some groups go for a swim, but others get right back to fishing and fish until it’s time to return for dinner. Around 5 the boats start coming back in, and Dez makes sure he’s there to greet each boat. Derrick runs out a few times in between making dinner since he’s anxious to hear if anyone’s caught a big fish. Sure enough, Shannon’s caught a really nice pike: 20 lbs plus. And then Tony announces he also caught a beautiful 20 pound pike, but it got off the hook right next to the boat after everyone had a good look at it. The other boats had a steady day of fishing too, and no one is complaining when they hit the dining room for fish talk and appies at 6. Cheeseburger soup in the making. And what a dinner Friday night is. Read the menu and weep! The photos say it all. Our guests are very full and very happy when they leave. 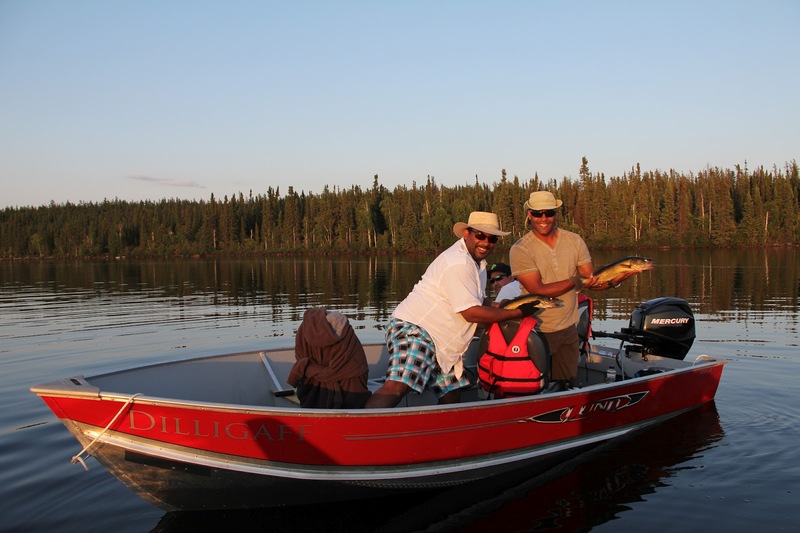 Some groups still haven’t had enough fishing, so they head out for some evening fishing—this time to Big Fish Lake for some lake trout action. Others stay behind to play cards and hang out with family and friends. It’s a great night. We decide it’s’ time for a break too. 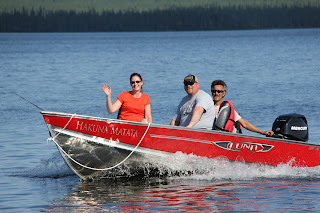 Since we have outdoor writer Brad Fenson and his soon-to-be-wife Stef up here experiencing Lloyd Lake, Derrick heads out on the water with them. They slam walleyes in the 2.5 to 3.5 lbs range until it gets dark. Dez heads out with new wife Elize and finds 2 boats fishing Derka’s (named for Derrick since it’s his favourite walleye spot on Lloyd). 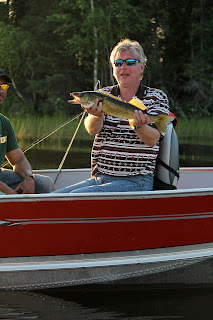 We stop by just in time to see Gary hook up with a nice walleye. We fish with them for a bit, but then leave them to the ‘eyes. More nice 'eyes! Good work, gentlemen. Colin and his brother, Michael, come with us. Soon enough they hook into a double with walleyes on the line. After that, we try a couple of spots but mostly appreciate the gorgeous Lloyd Lake sunset. The water is glass, the company is good, and the sky is red, purple and pink as the sun sinks behind the trees. What a night for being on the water! We get home and with Stef and Brad cook up a contest and some gag prizes to be announced at Saturday night’s dinner. Sunset fishing...just a man and his dog. Saturday morning is as pretty as Friday. We can tell our anglers are really unwinding. A few come in on time for breakfast, but most straggle in around 7:30 and even 8. It’s pancakes and ham this morning. Two of our groups are heading to Big Fish to try their luck for lake trout, so they hop in the truck to drive there. 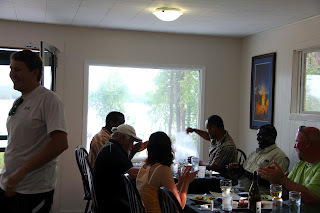 Everyone leaves the dining room satisfied as usual, and the last boat is off the dock at Lloyd by 9. Instead of doing our usual chilling out routine on the dock, we head out with our guests. Two brothers fishing the grayling hole, just like old times! 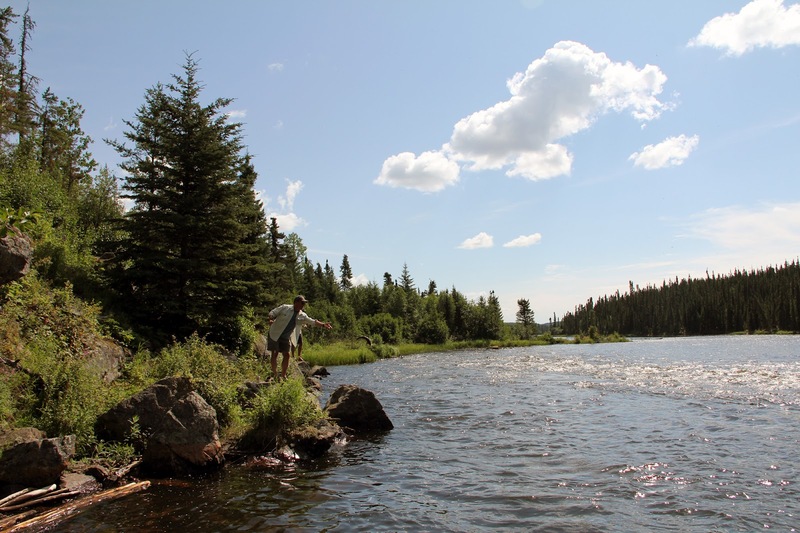 Today at Lloyd we’re fishing the grayling hole, a short way up the Clearwater River. It’s situated beautifully right before a dangerous set of rapids and right after a set of gentle rapids (not so gentle in spring—ask Derrick about that sometime when you come to the lodge…*wink*). We park the boat and step onto some big rocks. 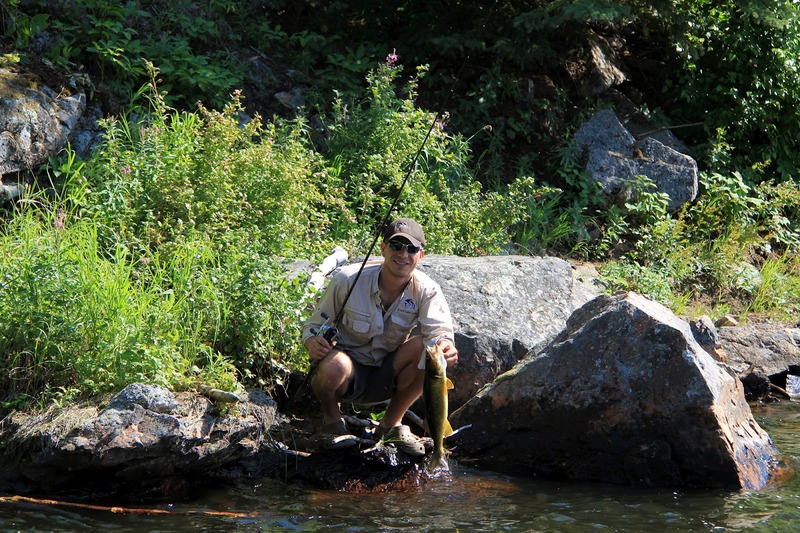 A grayling jumps right in front of Dez, but we catch walleye. 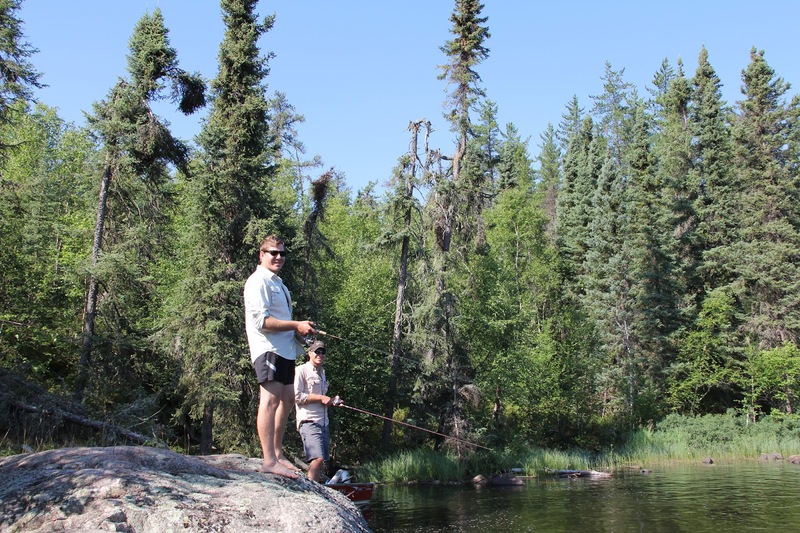 The exciting part of the grayling hole is that you never know what you’re gonna get—grayling, walleye, pike—they’re all there. 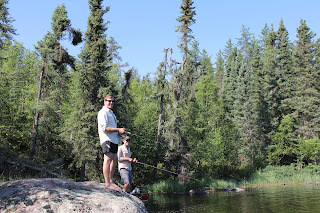 Later that afternoon, Stef and Brad are fly fishing the same spot and land 4 Arctic grayling. Stef’s first grayling, a 20 incher, is so stunning she cries. No, we’re not kidding—she’s been trying to catch one for a long time—we’re pretty sure this fish made her trip…sorry, Brad! Colin, his brother, their dad and grandfather arrive at the hole after a few hours of hot walleye fishing on the lake. By this time we’re trolling just above the second set of rapids next to the grayling hole and catching walleye after walleye, again. We hand our spot to the guys and park our boat at the trail leading to the river below the rapids. It’s too dangerous to go through the rapids with the boats, but a 5-minute walk gets you to the other side. We cast into the rapids and land walleye after walleye right on the edge where the rapids meet calmer water. Dez pulls out 10 fish and runs to tell the groups fishing the grayling hole about this hotspot. They show up right at the end of the hot streak, but Brad manages to pull out 6 nice walleye in about 5 minutes all the same. The scenery is beautiful—it’s another hot day. The sky is cloudless and the sun sparkles on the rapids—it’s impossible not to relax into the late morning. We find wild currents and gooseberries growing right behind us and pick the ripe ones off the bushes. Duty calls though, so we head back to the lodge when shore lunch time rolls around. 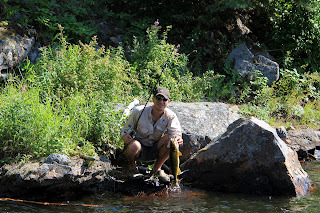 Derrick pulls out yet another walleye from the spot below the rapids. Brad returns one of the 6 walleye he caught in minutes to its home. Heading up the river to a shore lunch spot. Coca Cola wings going on the plate, and walleye wraps in the foreground. 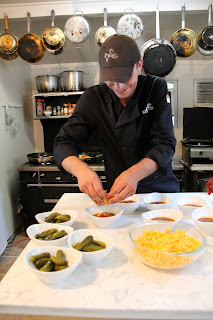 At 5 Dez is meeting boats and the truck from Big Fish and Derrick’s sweating it out in the kitchen, almost ready for the last dinner. In between slinging coca cola wings and walleye wraps, Derrick hears the news: John caught an 18 lb laker. Awesome fish! Everyone admires the photos before appetizers. Colin is thrilled too: he's caught his first ever walleye on the fly. As we’re putting appetizers on the tables, we hand out gag prizes—a holey net for the Tony who lost the biggest fish (sorry about the 20 lb northern…hope we see you back soon! ), bandaids for John who stuck a hook into his thumb on the first day, tissues for Stef so she can wipe her eyes the next time she catches a beautiful fish, a large barf bag for Michael since he wasn’t feeling so well on the plane ride over and might need one on the way back tomorrow. Stickers, lures and even a rock find new owners. Michael and his extra large barf bag get a hand. Judging from the laughter and the orders for seconds and thirds of the walleye wraps, everyone is having a great time. Monster rib-eye steaks cooked to our guests’ liking and fresh blueberry-apricot fruit tarts complete a flawless evening. 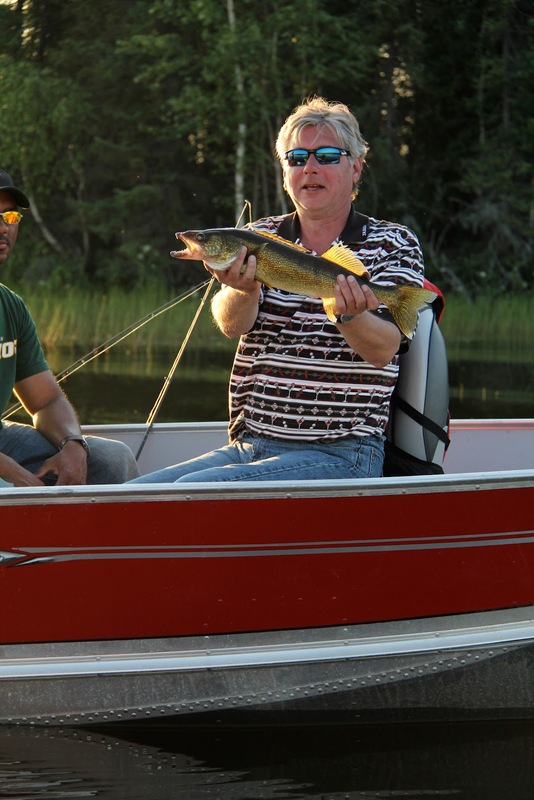 Gary and Shannon go to Derka’s and slay walleye. Jason and Aubrey catch pike after pike—they lose count. Sheryl and John explore some islands we’ve never fished and catch lots of fish. Michael and Colin fly fish pike off the dock. Colin leaves to play cards with his family, and Michael catches a nice walleye before also heading in for a game of crib with his grandfather. 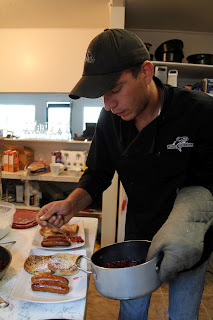 Sunday Breakfast: French toast and sausage. Sunday morning at 6 am, Derrick spots Tony on the dock and takes him a coffee. Inspired by his sons’ success the previous night, Tony’s decided to catch a few fish before breakfast. Brad shows up soon after with his and Stef’s to go mugs for their first coffees. Almost everyone is on time for breakfast today—last day of fishing! The groups switch lakes, so yesterday’s laker crew is on Lloyd one last time, and the Lloyd crew fishes Big Fish Lake for their shot at a nice laker. Brad is successful—he jigs up a 12 lb lunker, but Colin tops that with an 18 pounder. On Lloyd, the walleye slaying continues. Shannon tells us he’s never caught so many fish in his life. Sheryl and John explore some remote territory. They try their luck on Preston Lake, and enjoy the experience so much that they book for next year before they leave. We’re honoured! Can’t wait to see you next year! The boats come home at 3 so people can pack up their bags and maybe take a quick shower before the planes show up at 5. 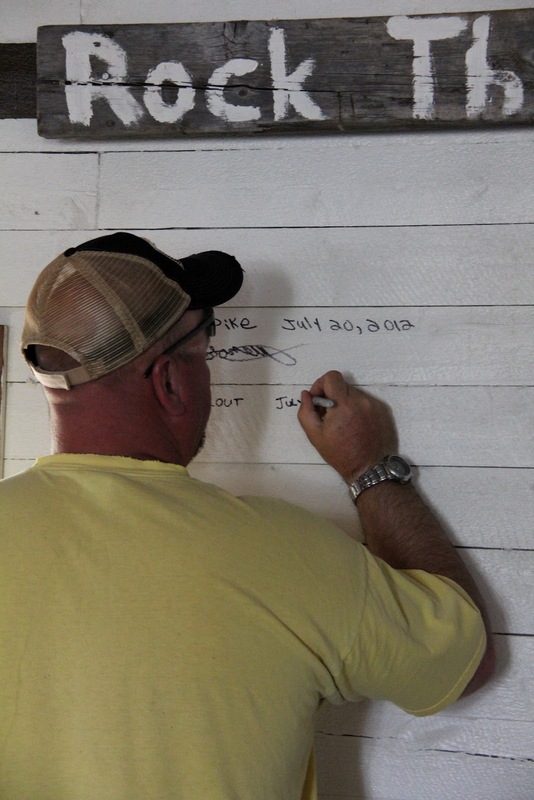 Sometime between 3 and 4, Desi starts a new Lloyd Lake Lodge tradition: everyone who wants to, and especially those who caught big fish, writes on the wall in the conference cabin. We scrabble up some Jiffy markers for the occasion. John ads his 18 lb lake trout to the conference cabin wall. Thanks for helping us start a new Lloyd Lake tradition, everyone! We had a fantastic time with you, and hope to see all of you back here soon.